DC has just released this image, so I will share it here, too. This is the cover to Supergirl issue 34, my first cover as the new regular cover artist for the Supergirl monthly series. 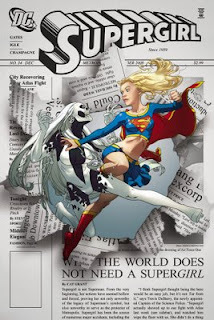 The idea of having Supergirl and Silver Banshee busting out of a newspaper article came from DC (I believe the new writer, Sterling Gates, suggested it originally) and after sketching a bit, I thought it would be nice to make the cover itself the newspaper, incorporating the logo and other trade dress into the design, rather than showing a newspaper sitting on a table or something. DC liked the idea, so I set to work figuring out how to incorporate all of the text. DC was kind enough to provide me with all of the logos so that I could marry them to the drawing naturally. In the end, placing the text was a bit of a pain, especially on the torn pieces from the reverse side of the paper. I actually cut up some newspapers to figure it out. I hope the end result is worth all of the effort. I did learn a bit more about Photoshop's text editing tools, which are more powerful than I had realized. Fans of the series with a careful eye may be able to piece together some story "Easter eggs" in the various headlines. I am already working on the next one, which might also incorporate the logo into the art in an interesting way. I'm going to try to keep it interesting every month.